Bone Spur is referred to a condition wherein there is an outgrowth of an extra bone over the original bone. Bones Spurs are known as Osteophytes in medical jargon. Though a Bone Spur does not cause any significant pain by itself but when a Bone Spur brushes against other bones and tissues around it, a sharp pain arises. This happens because the brushing of the Bone Spur against the tissues over and over again causes them to break or tear resulting in swelling and pain. Parts of the body which are more likely to develop Bone Spurs are shoulders knee, mouth elbow, toes, hips, spine, heel, nose, neck and fingers. Bone Spurs in the foot can lead to Corns and Calluses. Bone Spurs on the spine indicate the condition of spine degeneration in patients above 60 years of age. This is an age-related degeneration. For the treatment of Bone Spur, mostly non surgical methods like anti inflammatory medicines are widely prevalent but in certain cases surgery may also be needed. Common home remedies for Bone Spur include physical therapies like massages, applying ice packs etc. These home remedies have been in effect since ages and have been proved beneficial in most of the cases. Osteoarthritis and Tendinitis are the most common causes of developing Bone Spurs. Other diseases that encourage such outgrowth are Plantar Fasciitis which causes Heel Spurs, Ankylosing Spondylitis which causes Bone Spurs on the spine, and Diffuse Idiopathic Skeletal Hyperostosis (DISH) which also leads to Bone Spurs on the spine. Other reasons include sports injuries, faulty lifestyle, accidents, and lack of proper nutrition. 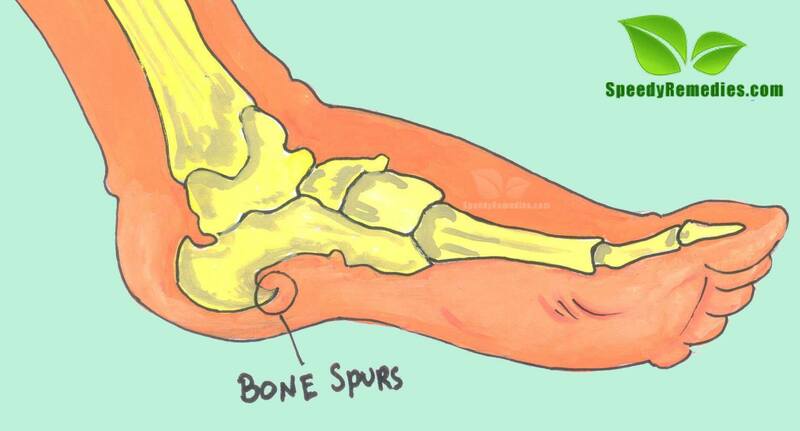 As mentioned above, Bone Spurs do not cause any symptoms until they rub against the nearby tendons and tissues. But when this repeated rubbing takes place, it results in extreme pains. The pain can also be accompanied by numbness and inflammation. The symptoms depend on the location of the Bone Spur. Heel Spurs lead to local foot pains and tenderness. If the Bone Spur is located on the back or neck, it may result in mild back pain or neck pain while standing or walking. Bone Spurs on shoulders are characterized by pain in the shoulders and head. In genera, there is numbness, weakness and a tingling sensation in the affected area. • Prepare flaxseed hot pack by putting heated flaxseed in a thick cloth. Applying this hot pack on the affected area is one of the most popular natural home remedies for Bone Spur related pains. • Steep two or three chamomile flowers in a cup of boiling water. Strain it and let it cool for a while before use. Use this decoction to wash or bathe the affected joints to reduce the pain and cure them. Both fresh as well as dried chamomile flowers can be used for this purpose. • Consuming 500 mg of curcumin (the yellow pigment found in turmeric) on an empty stomach daily (3-4 times), preferably in the morning is an effective natural remedy for this problem. It is advisable to continue this home remedy for at least six weeks. • Mix one teaspoon of rose hip and one teaspoon of horsetail in one cup of boiling water and allow it to steep for around 10 minutes and then strain it. Drinking one cup of this tea about 3 times a day is a valuable home remedy that specifically aids the healing process through its therapeutic properties. • Soaking both the feet in cold and hot water alternatively is one of the easiest possible home remedies for Bone Spur. • Dip a cloth in warm linseed oil and apply on the affected area and wrap it with another cloth. Try to keep the area warm to facilitate quick healing. • Applying ice pack on the affected area four or five times a day is one of the most widely used home remedies for Bone Spur. • Yoga and acupuncture are highly beneficial natural home remedies for Bone Spur treatment. • Maintaining proper levels of calcium and magnesium in the diet prevents the unnecessary calcium formation which increases the risk of developing Bone Spurs. This is regarded as a highly recommended home remedy for Bone Spur prevention and cure. There is no specific diet advised for Bone Spur treatment or prevention. Still following a balanced nutritious diet can help one stay healthy. The diet should have a proper mix of magnesium and calcium. Calcium must be cautiously formulated so that it can be easily digested. Alcohol, tea, coffee and sugary products should be avoided as far as possible as they tend to slow down the healing process and disturb the mineral balance of the body. Including light exercises in the lifestyle can provide some relief. Overweight people should try to reduce their weight which tends to put more pressure on the foot and worsens the Heel Spurs.